elobeatlesforever: Another Art Breaks: It's ELO Time! Hello ... Hello ... my old friends ... It's great to see you once again! The involvement of Jeff Lynne in the "Xanadu" movie soundtrack (JETLX526), on the face of it, yielded more chart success for ELO. The title track, their duet with Olivia Newton-John, gave them their first #1 single in the UK with the OST managing #2 in the album chart and three (3) other ELO singles: "I'm Alive", "All Over The World" and "Don't Walk Away" attaining #20, #11 and #21 respectively yet failing to dent the Top 10. 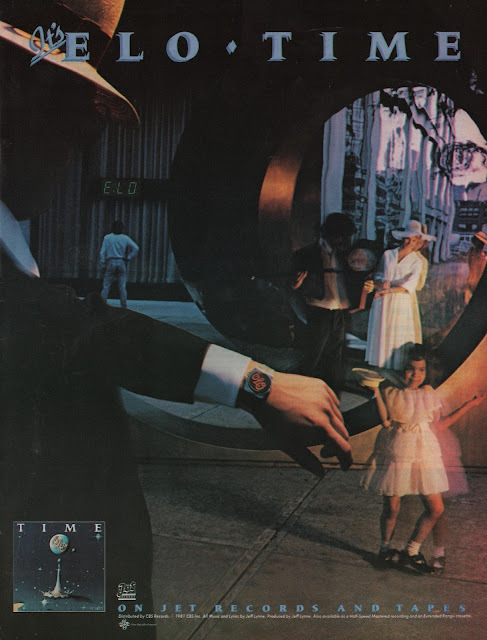 A significant change in direction and style came next with "Time" (JETLP236) in 1981 featuring a streamlined ELO, largely with their trademark strings largely supplanted with a new futuristic synthesised sound. 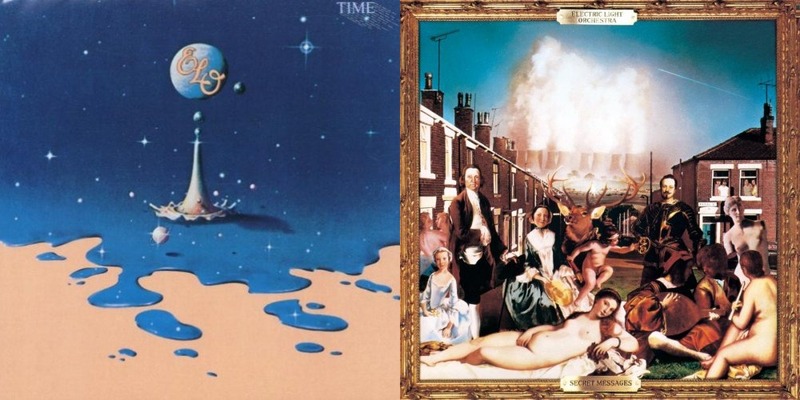 "Time" topped the UK album chart again and gave ELO their final UK Top 10 single "Hold On Tight" with two other singles: "Twilight" and "Ticket To The Moon"/"Here Is The News" making the Top 30 and, more significantly, "The Way Life's Meant To Be" failing to chart at all. The album art for "Time" had an almost kind prophetic of 'Time is running out' theme to it. The well documented reduction of next album "Secret Messages" from an inspired double album (JETDP402) to the 1LP edition (JETLX527) - for dubious reasons - which reached #4 when released in 1983 could well have been 'the straw that broke the camels back' for ELO maestro Jeff Lynne, as he completed his contractual obligations with "Balance Of Power" (EPC26467) in 1986. Following "Time" and the ensuing world tour came the famed Garden Rehearsals and recording sessions at Jeff's then home which became "Secret Messages". Yet the themes, recording techniques and even imagery of "Time" and "Secret Messages" were much more intertwined than perhaps many realized, back in the day. Even as a 15 year old, listening to "Secret Messages" when it cane out in June '83, I was aware of a progression from "Time", the product of the lyrics and production values from both records. 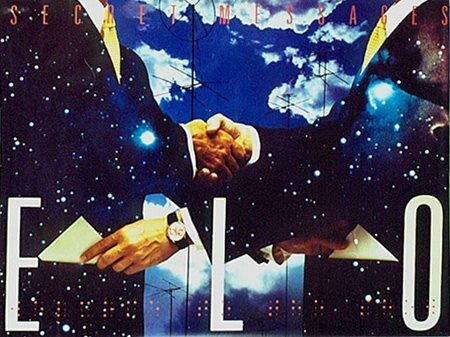 In later years - and the reason that elobf originally came into being - we learnt of those missing 2LP tracks from "Secret Messages" and even the alternate artwork depicting secret handshakes with ELO watches in prominence. Which brings me to the subject of this article. Yours Truly KJS recently acquired a fascinating and most interesting poster advert for "Time" (see top of article) from Billboard magazine in which similar themes prevail as those for the alternate "Secret Messages" artwork with perhaps a nod as well to the classic Star Trek episode "The City On The Edge Of Forever". For me, the poster begs the question as to whether there may also have been alternate album artwork considered for "Time" too. elobeatlesforever (elobf) hopes that it is something of interest to ELO fans here in Yours Truly 2016 as we "Zoom" into 2017.